Student-run record label, Pioneer Records, part of Point Park University's Rowland School of Business and the sports, arts and entertainment management department, has selected Gabe Reed as the newest artist to join the label. 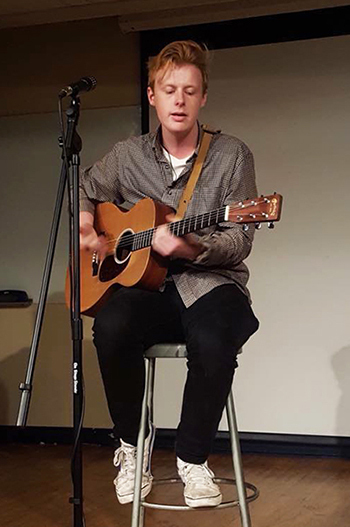 The multi-talented singer-songwriter was selected from nearly 30 submissions from all over the Pittsburgh region along with Point Park students. As a Pioneer Records artist, Reed will receive 300 copies of an EP recorded by Jesse Naus at Red Caiman Studios, a student-produced music video, management, bookings and more. He will also have a CD release party and the debut of his music video at the Club at Stage AE in April 2018. A native of Wadsworth, Ohio, Reed is a musical theatre major in the University's Conservatory of the Performing Arts. "I was really excited to be selected to record for Pioneer Records," Reed said. "I've been writing and performing songs since age 13 and this is just an amazing opportunity to get to the next level." According to Reed, his taste in music has always been eclectic. "I listed to everything from Prince to Alt J to rappers like Eminem," he said. Encouraged to play guitar by his father, whom he watched play consistently growing up, Reed also plays saxophone, piano and banjo. Pioneer Records was established in 2014 and has named four recording artists to its label. SAEM Associate Professor Ed Traversari, M.B.A., oversees the label. "Pioneer Records offers our students first-hand experience in developing and marketing an artist and all that comes with that, including booking, publicity, social media and marketing," Traversari said. Previous Pioneer Records artists have included Hannah Jenkins, John Kono Rushlander and Chase and the Barons. Learn more about Gabe Reed and check out his music and photos on Facebook, Twitter and Instagram.